Irish scarf is a white design that features green shamrocks along with four leaf clovers. 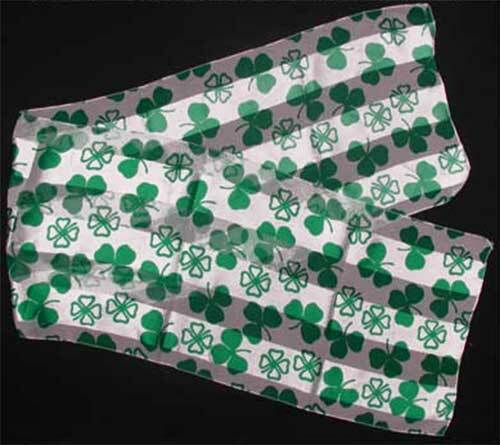 This women's shamrock scarf is further enhanced with green four leaf clovers and it and measures 12" wide x 56" long. The white Irish scarf is lightweight polyester and it is received with a shamrock history card, complements of The Irish Gift House. Irish scarf is a green and black color design that features a spray of shamrocks. Irish scarf is a cream color that features an all over shamrock design. Irish scarf is a fashionable and lightweight design with shamrocks. Irish scarf is a black design that features green shamrocks and four leaf clovers.